The Audio Damage 914 Fixed Filter Bank is a faithful recreation of the Moog Modular Synthesizer's 914 module, and a major upgrade to our original 907A plugin. 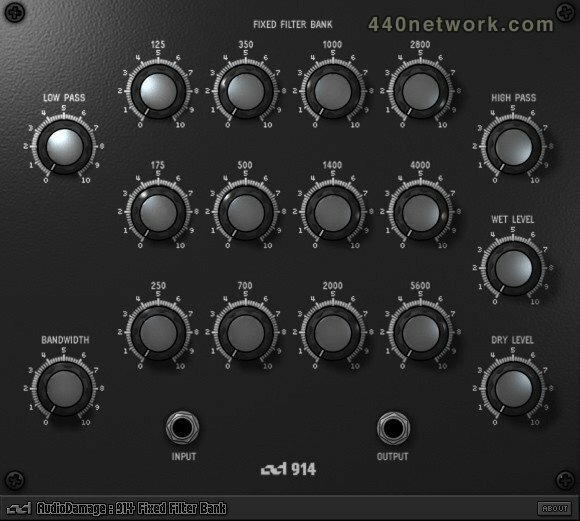 This plugin creates unique filter textures by passing the signal through twelve band-pass filters, as well as a low-pass and high-pass filter. 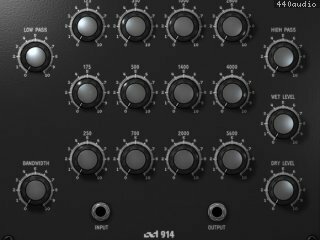 The 914 is a subtle effect, capable of adding rich luster to pads, and giving percussive and lead synth sounds a vocal quality. It is an excellent tool for the sound designer's palette, simple to use yet capable of complex and unique timbres. Improvements over the original 907A include a bandwidth control, separate level adjustments for wet and dry signal, makeup gain, and four extra frequency bands. - 24db Low-pass and high-pass filters. - Twelve fixed-frequency band-pass filters. - Separate wet and dry level controls. - 15dB of makeup gain on the wet level. - Full MIDI learn mode, for MIDI CC control of every control (VST only; handled by host in AU version). We have just put up the installers for v1.1.0 of 914 Fixed Filter Bank. This adds 64-bit versions on all platforms, removes Mac PPC compatibility, and fixes several minor bugs.